Raising a yagi onto guyed towers requires moving them over or between guys. There are alternatives that are often impractical or expensive. These include hiring a crane or lifting the boom and elements straight up and assembling them in the air. For most hams a tram line is used since it is economical and not overly complicated. Details matter, however, since doing it wrong can cause real grief, from lost time fixing mistakes to complete loss of the antenna or injury. Work on my big tower has been progressing apace such that I am now able to attach antennas. I have raised the first antenna and did it with a tram line. This is a side mounted yagi at ~120' (35 meters) fixed on Europe (northeast). Since time is pressing as the weather grows colder I am relying only on antenna I have on hand. Therefore I am using my Hy-Gain Explorer 14 short boom tri-bander. Next year I will switch to higher performance antennas. I previously raised this antenna onto my 15 meter antenna in Ottawa, also using a tram. That tram had the antenna sliding up two ropes. That is impractical for my new tower. Instead I am using a more traditional tram line. I'll step through how I did it in enough detail that you could do it yourself. In fact I did this operation entirely on my own. Since there were numerous tasks necessary to get everything working properly I did not want to call anyone out here to sit around while I fussed. 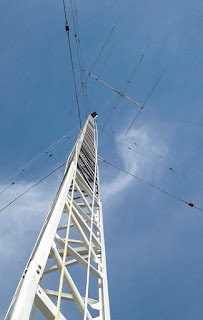 When the bigger antennas are trammed to the top of the tower I will be relying on friends to help out. The tower came with several items that were used for side mounting yagis. From these I selected what I needed to make a simple bracket suitable for this antenna. I will replace the bracket next year, but for now I saved time by using what I have on hand. The bracket is comprised of two lengths of angle stock. One bolts directly to a tower girt while the other uses pinch clamps which allows it to be placed at any position. The weight bears on the lower bracket by means of a bolt, not the cheap muffler clamp you can see. The upper bracket holds the upper end of the pipe. A pipe substitutes for a mast to enable use of the antenna's stock boom-to-mast clamp and to allow some directional flexibility for pointing the yagi. Rigging for the tram line had just been installed when the picture was taken. A large shackle anchors the aircraft cable used for the tram line itself. Below the anchor a pulley is affixed to the pipe mast. The rope is used to haul the antenna along the tram line. The cable for this operation is ~180' (55 meters) long. More than 300' (90 meters) of rope is required. 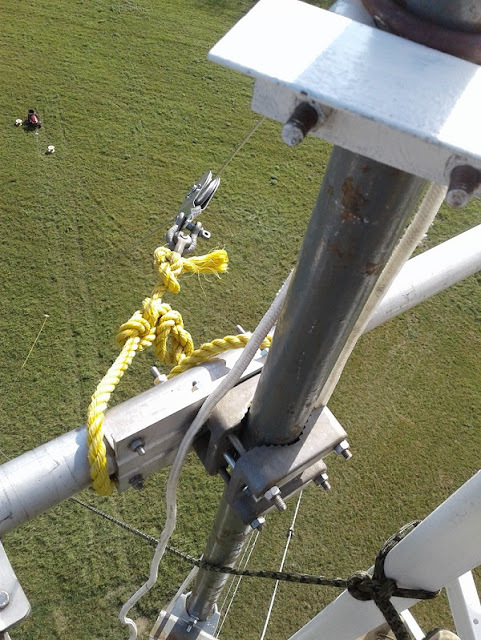 Although it is possible to haul the antenna from the tower (with a shorter rope) it is far easier to do it from the ground. As a general rule every task is 3 times more difficult on the tower than on the ground. There is a lot going on in this picture so I'll step through all of it. First I needed an anchor for the tram line. My lawn tractor was ideal: it is portable. heavy and comes with a tensioning device: reverse gear. There are three positions from which tramming can be done on a guyed tower, between each sets of guys. This area happens to be the only one without trees nearby; trees can be excellent tram line anchors. Unfortunately I had to use the treeless area to achieve the correct orientation. Orientation is critical and requires careful planning. The position of the side mount bracket is no accident. It is the only one compatible with the bracket and pointing this particular antenna towards Europe (the antenna in the picture is oriented exactly in that direction). Notice that on this 3-element yagi the driven element is forward of the boom centre. The bracket (as we'll see) ensures that when pointed northeast the elements all stand well away from the tower. The boom half of the mast clamp had to be reversed so that it faces the tower, for the same reason. This was easier than flipping all the elements so that the trap drain holes point down. The flat side of the clamp faces the tower, ready to be bolted onto the other half of the clamp when the antenna is lifted. "I can fly! I can fly!" The rope securing the boom to the tram line pulley and the haul rope must be at the antenna balance point (centre of gravity), which in this case is right where it should be: the boom-to-mast clamp. Each rope must attach at two symmetrical points either side of centre so that the antenna cannot rotate on the tram line, twist or waggle up and down. Getting it right is very important. I fussed with it for over an hour and had to reverse the lift a few times until I had it perfect. The basic process is to do all the rope work with the antenna on the ground (supported off the ground itself), with the tram line slack. The tram line is then placed under tension, which will lift the yagi off the ground. Make sure the haul rope is tied off or the yagi will roll backward! The ladder you see was used to inspect and adjust the ropes and pulley as the yagi first lifted off the ground. The elements are pointed slightly upward to assist with clearing the guys immediately below the bracket. A tag line is attached to the boom so that the elements can be steered around the tower and guys, if necessary. The tractor made this stage of the operation easy to repeat several times as I fixed problems with the rigging. Remember to chock the wheels when the tension is set! Hauling the antenna up the tower is perhaps the easiest task. Setup takes the most time, and is well worth the investment of time and efforts. Should the antenna spin out of the correct orientation while hauling I strongly recommend immediately lowering it and fixing the problem. 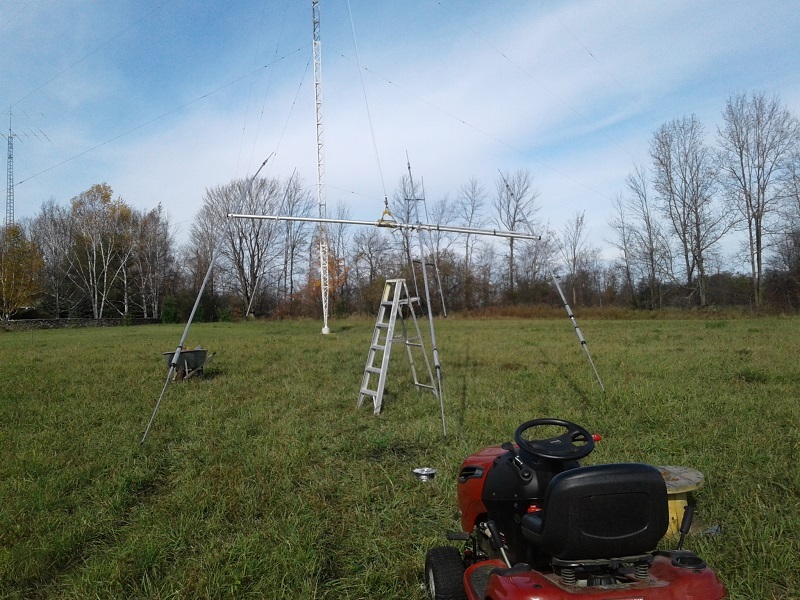 It's far easier to correct problems on the ground than while the yagi is dangling 30 meters in midair. The Explorer 14 weighs only 45 lb (20 kg). Hauling the antenna up the tram line by hand is quite easy. It is made easier by the mechanical advantage the tram line affords. This is because the antenna is travelling up a slope rather than straight up. The trade off is a longer hauling distance. 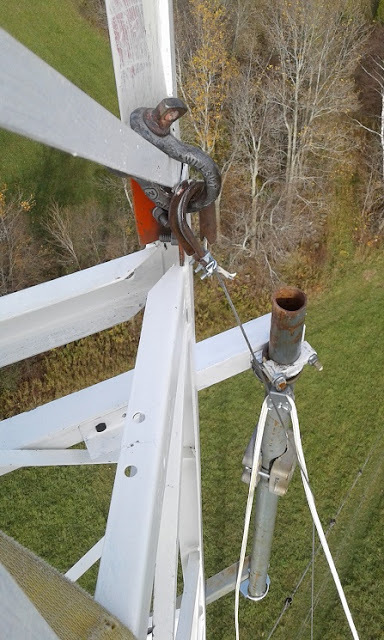 I attached a rope cleat to the bottom of the tower so that I could rest during the haul and to secure the antenna while working on it on the ground or in its final position. In the next picture the antenna is beginning to straddle the tower. I didn't even need to use the tag line to achieve this perfect orientation. After all the trouble with the setup the antenna raising proceeded beautifully. If you are not so lucky do take the time to ensure the elements each go where they should. If the tag line in insufficient do it from the tower. Yagi element tips are fragile! This is where having a friend along to assist is very welcome. What you can't see in the picture is the wind blowing. The wind was 20 to 30 kph perpendicular to the tram line, with gusts up to 50 kph above the tree tops. It wasn't a factor. Although I was concerned about the wind there was a storm coming in followed by a forecast of several days rain. So I went ahead. When the tram is properly rigged a stiff breeze is not a serious difficulty. Once the haul rope bottoms out on the pulley the hauling is done. Done properly the boom-to-mast clamp will rest very close to its intended position. Before climbing the tower the tram line should be made slack. When you do this the haul rope will relax and allow the antenna to rest against the mast. Bolting on the yagi is made easier when the tram line and pulley don't offer resistance. The vertical position of the yagi can be adjusted after it is clamped on and the tram line system is detached. Don't delay climbing the tower when the tram line is slack since the antenna has more freedom to move in the wind. In the adjacent picture the yagi has just been bolted to the bracket mast and the tag line (green) and haul rope (white) removed from the antenna and tied off. The picture shows detail that was missing in earlier pictures. There are a few items to note. I used the boom half of the clamp to achieve the two symmetrical tie off points for the haul rope and tram line cradle. There are two shackles connecting the cradle to the pulley. With just one shackle the yagi would twist to one side. To slip the pulley on and off the tram line I used one with a removable wheel (sheave). To get it off the tram line I knock out the axle retaining clip, remove the axle and then separate the wheel from the body. It goes back together the same way. This is quick and easy compared to detaching the cable anchors to slide the pulley off the end of the cable. I did not take an antenna analyzer up with me. With the conductive tram line present I would not have gotten good impedance measurements. I'll do that the next time I'm on the tower. I don't anticipate any problem. My modelling of guy interactions with respect to the orientation of this antenna promises no difficulties. We'll have to see if that is indeed the case. The bottom of the tram line was tied off at the tower but left anchored at 120'. It will next be raised to the very top to raise larger yagis to the rotating mast. This small lift was good practice. The antenna was raised on the Saturday of the CQ WW SSB contest. The weather was about to turn ugly and I was in any case unable to effectively compete due to my temporary lack of good antennas during construction. I expect to do better when the CW contest rolls around in several weeks.